Patrick and his girlfriend Hannah made a cross-country move to Portland, Oregon last year in Patrick's Camaro. Once they were established, Hannah needed a car for her commute and bought Patrick's car. Her feelings on the care and ownership of the car differ from her boyfriend's -- namely, she sees the car as a utilitarian possession and Patrick thinks she should have some care for its appearance. Who is right? 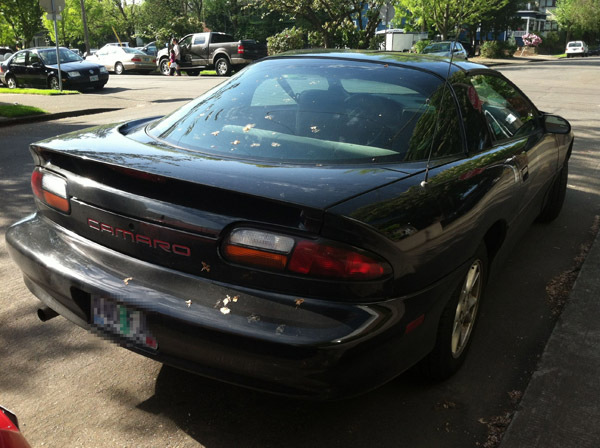 Backed up on my Hodgman podcasts, so to an empty Internet I confirm: everyone in Portland knows Bitchin Camaro. I just wish Judge Hodgman and Bailiff Jesse had gotten to the joke about the People's Court. Couldn't he just wash the car at home with a hose and a bucket of soapy water? Better to spend the money on oil changes, topping up the coolant, making sure the rebuilt differential has oil in it, new air filter, and keeping it aligned. I'm from Portland and have to say that Patrick and Hannah (and Judge Hodgman) should do their homework. Roads in Oregon get sand when it snows - not salt. Thus, we don't have to worry about washing our cars to avoid salt-induced corrosion. When I was a kid, my dad bought a 70s Mustang from a guy he knew who bought/drove the car in Ohio. The muffler fell halfway off while driving on Interstate 5 from OR to WA due to salt-induced corrosion. Luckily we had some extra speaker wire in the back of the car. That held for awhile, then it melted further down I5. The final fix for that journey was using a metal coat hanger to tie the muffler in place. On a car-related note, my dad once tied a Christmas tree trunk first on the top of his Jeep Cherokee - held in place with twine. It didn't take too long on I5 before the tree succumbed to air resistance and flew off the roof, landing on the highway behind us. Luckily, nobody was injured. Ah, the good old days! It is true that Portland puts sand on wintry roads. Our city is one of the worst at dealing with snow and ice, but fortunately we don't see much of it! I just wanted to take a moment, however, to defend Patrick and Hannah with regards to the salt commentary. They were referring to a snowy drive up Mt. Hood, not a drive in Portland. I would have to assume that the snowy roads of Mt. Hood are salted during the winter. That is all. If you put sand on your streets instead of salt, you are doing it improperly. Is the cost of of the car wash Hannah's only issue? If so, I bet she can find a gas station that offers free touchless washes with a minimum gas purchases. I have found stations that offer such a thing all over the country! At least under common law, consideration was given by Hannah for the Camaro by her promise to pay for various things when they arrived in Portland. Upon agreement that promise was enforceable, and either party would have been in breach if they had failed to fulfill their end of the bargain. In this podcast, you asked if someone who knows something about law could address the enforceability of the parties' contract in a court of law. I respectfully submit that I know something about the law and can respond. Your Honor may be pleased to know that the contract is valid and enforceable. The first-week-of-law-school definition of a contract is an offer, an acceptance, and something given in exchange by both sides. 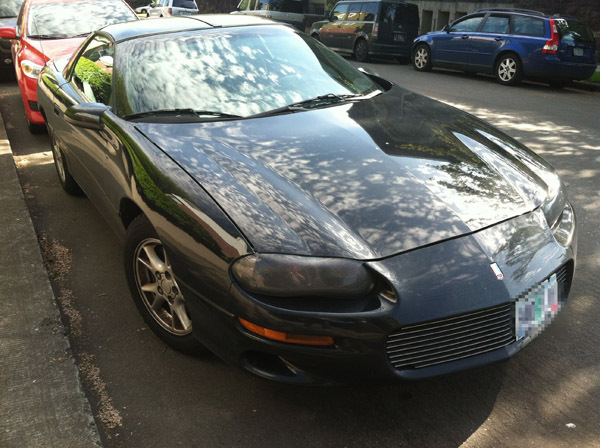 In this case, the offer was the purchase of the car in exchange for debt forgiveness. Hannah got a car, Patrick got debt forgiveness. Valid Contract. Nevertheless, I take exception to the Court's ruling. Both sides should have lost on the ground that they each owned a Camaro and did not know Bitchin' Camaro. Car proprietas es postulo scio carmen socius per suum car. This episode had the first quote I've ever been able to identify on Judge John Hodgman. And I'm only eighteen. I know that Cameros aren't really the most practical car, but he has a tie to it that can't be ignored by the girlfriend. If it means something to him and he sold it to her to keep the relationship power dynamic equal, what does it say about her that she can't take care of it? Frankly, this girl sounds like an awful, lazy, childish, spiteful person. I'd really look at the relationship if I were this guy. It doesn't seem like she respects him, his property or his feelings. I'd buy it back at the nearest opportunity and dump her. That opening sequence was probably one of the most amazing things I've heard in a long time. Additionally, it makes me extremely happy and proud that my 9 year old daughter knew exactly what song it was (though her favorite song remains Punk Rock Girl). Kudos to you, your honor. Your discussion of merging traffic was a revelation to me. It had never occurred to me that those who speed ahead of merging traffic to cut in at the last minute were anything but anti-social machiavellians. After hearing your comments, I realize that not only do such people not feel guilty about cutting in, they may in fact feel they are the more enlightened of the two types of drivers. This awareness will certainly influence my response to said behavior. It is much slower if you wait to merge because, if everyone waits to merge, you typically alternate one vehicle at a time. If you merge within the mile or two before, you can have multiple mergings happening at the same time, therefore significantly faster traffic. Judge John Hodgman, please retract your statement in a future podcast. Hannah is totally right....Washing a car makes no sense. It's just going to get dirty the next day! PS Ohio is better. why did you leave us?